If you want to create a simple event (What, Who, When), simply click on any day in the calendar. 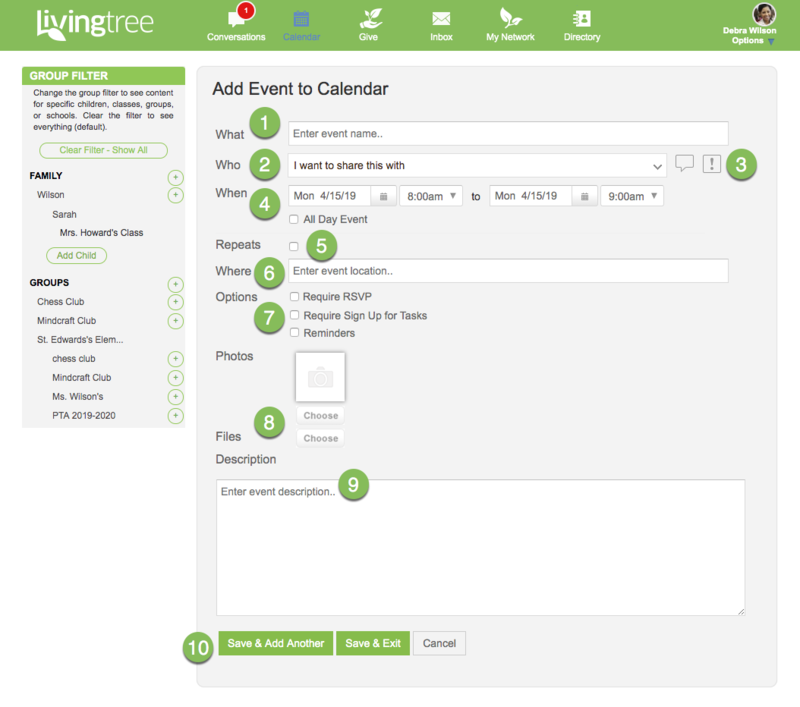 To create an event that has a few more details, click the green '+ Event' button. This will open the event creation page for you (see below). Similar to conversation posts, this is where you select the group(s) you want to share your event with. Members of the group(s) you select will see the event in their Livingtree calendar. Click the comment bubble to disable comments on this event. Click the '!' icon to disable immediate notification to your recipients of your event - this means once you save and exit your event, recipients will not be notified (email and/or mobile push notification). Adjust the date and time for your event, or select 'All Day Event'. If you have an event that repeats (weekly, monthly, yearly, etc. ), simply select this option and enter the duration and frequency of the event. If all your events in the series are not exactly the same, you can still edit specific events in the series after creation is complete (remove dates, change times, signups, etc.). Enter the location of your event here. Easily manage your event by enabling the following options: Require RSVP - Select the RSVP function to allow your guests/attendees to respond with their attendance status. When you monitor your event, you will see the list of people attending. Require Sign Up for Tasks - Create as many items as you would like for things you need people to do or bring for your event. This can be used for things like parent/teacher conferences, snack parent, carnival sign ups, etc. Reminders - Enable and adjust when you would like participants to receive reminder notifications for the event. See below for more guidance on sign ups, RSVPs, and reminders. You can add photos and files to a specific event by uploading them here. Other users invited to the event will be able to view and download anything you attach. If you like, type a description for your event here. Click the 'Save & Add Another' button to create multiple events without starting over every time. Click the 'Save & Exit' button when you're done creating events.